SAMPLE EXERCISES – Now Write! Now Write! Science Fiction, Fantasy, and Horror sample exercises available soon. Plausibility by Aileen G. Baron (download now). The Offbeat Protagonist by Deborah Coonts (download now). Planting A Seed by Gerard Bianco (download now). 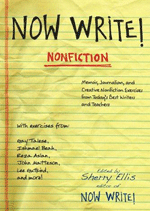 Learn more about Aileen, Deborah and Gerard on the Now Write! Mysteries Contributor page. The Almighty Verb by Beth Serlin (download now). Non-Verbal Communication by Andrew Osborne (download now). Write Cinematic Scenes by Stephen V. Duncan (download now). Learn more about Beth, Andrew and Stephen on the Now Write! Screenwriting Contributor page. On Propriety, Or The Fear Of Looking Foolish by Paul Lisicky (download now). Permission to Eavesdrop by Malina Saval (download now). Learn more about Paul and Malina on the Now Write! Nonfiction Contributor page. The Interview by Lauren Grodstein (download now). Birth of a Story in an Hour or Less by Crystal Wilkinson (download now). Seven Drafts in Seven Days by Porter Shreve (download now). Learn more about Lauren, Crystal and Porter on the Now Write! Contributor page.